(“Code”). Please retain your receipt(s). Download the “ROASTERS Frenzy” App from the Apple App Store for Apple iPhone devices or via Google Play for Android devices. Play the game and complete the challenge in the manner described in the Application’s tutorial. Participants may play the game as often as they want but to accumulate multiple chances for them to win one of the Mega Prizes, they must enter a Code each time. Participants who succeed in completing the challenge will receive a KRR meal voucher and stand a chance to win one (1) of the Mega Prizes. Participants who fail to complete the challenge will receive a KRR meal voucher (“the Voucher”) but will not be eligible to win a Mega Prize. The vouchers are only valid for ten (10) days from the date of issue. Each Mega Prize winner will be contacted directly by the Organiser. The ten (10) Mega Prize winners will automatically qualify to compete in an on-ground event to win the Grand Prize. 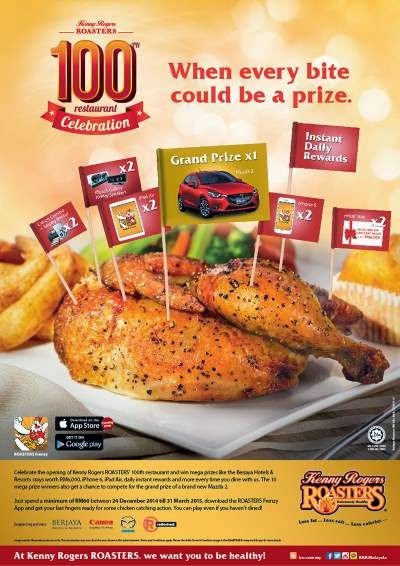 Visit Kenny Roger ROASTERS: ROASTERS Frenzy terms & conditions page for more details.